That’s it, I’m not going to trust MREs any more. I’m sure you’ve heard of them, Meals Ready to Eat? The things you get in the military when you’re not near a chow hall or mess tent? Well, the reason they’ve lost my trust is BE-101 Beef Stroganoff. I ate that plenty of times. As far as MREs go, it wasn’t too bad. It doesn’t come on that white plate or have some nondescript leaf stuck under it, like the picture in that link, but it was okay. The problem is, I thought that was what beef stroganoff was supposed to taste like. I never had it growing up, so I didn’t know any better. But then Kim requested it, so I made it. Ho. Lee. Cow. This stuff is good! And did I mention good? Don’t worry too much about exact amounts on this. You’ll probably want to measure the first time, just so you get it close. But this is one of those recipes you’ll be able to throw together and tweak the taste as you go. 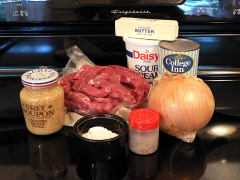 He looked at me and said, “Stroganoff? You don’t want round. That’s got to cook longer. 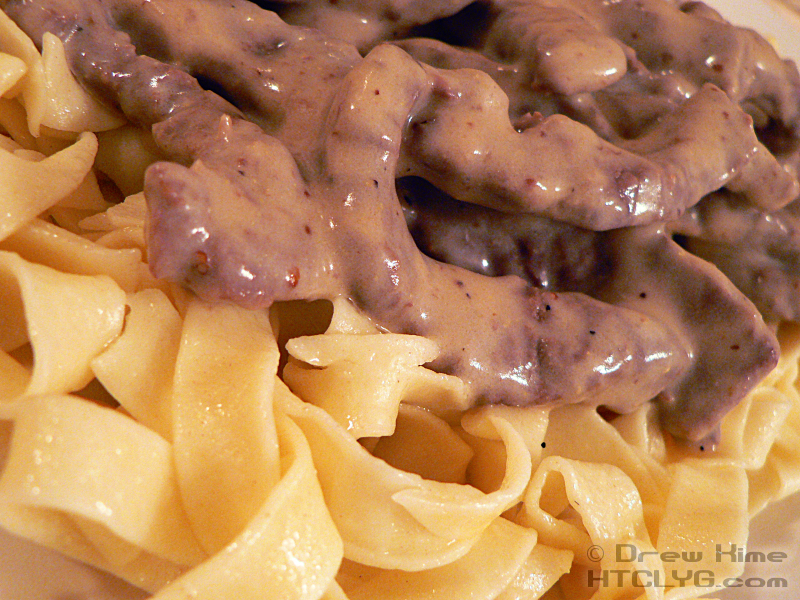 It would be tough in a stroganoff.” See, that’s why you go to a butcher instead of the grocery store. Had I just picked a pre-packaged hunk of meat myself I’d be writing about how disappointing this recipe was. So I asked Larry — that’s the butcher, in case you weren’t keeping up — what he would recommend. 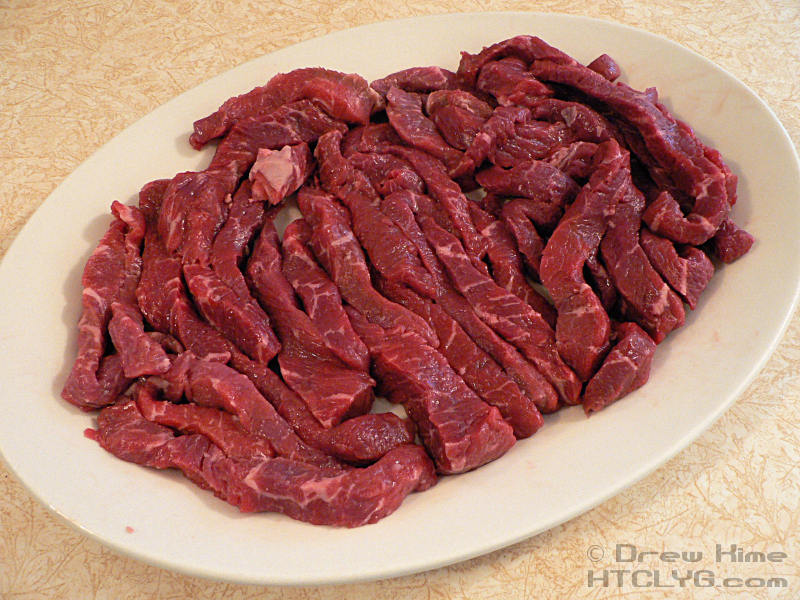 “How about some sirloin?” Okay, you’re the meat guy, lemme have it. While I went to get the lunch meat at the other end of the counter, Larry went in back for my sirloin. 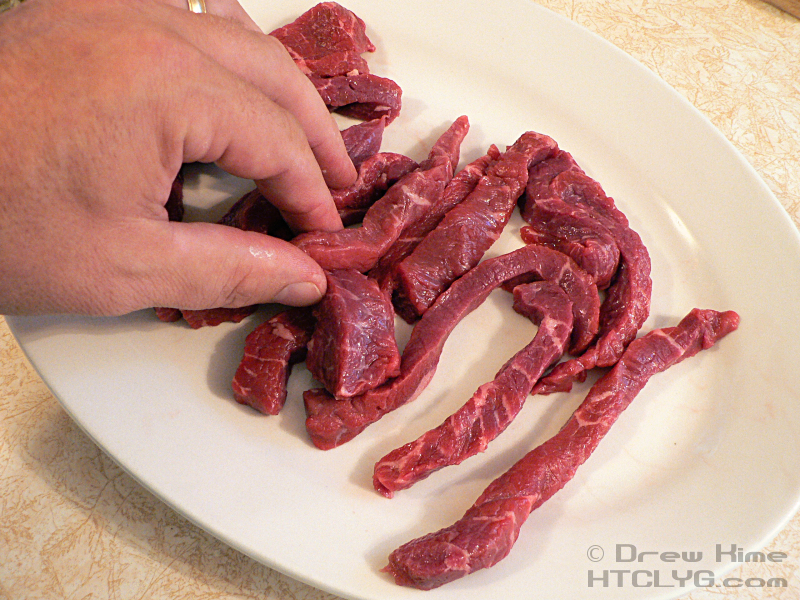 When he brought it out, it was already sliced in strips like you see in the picture above. My first instinct was to say, “No no no … I need it uncut so I can show that on my blog!” But then I realized, this is also why you go to the butcher. I told him what I was making, asked what cut to use, and he prepped it for me without being asked. Awesome. You rock, Larry. So, now that I’m done raving about Larry … I still had to prep the onions. Trim the core out and peel the outer layer. 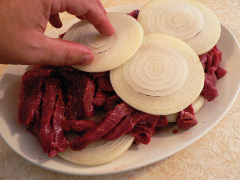 Then slice into thin rings. Not shave, go about 1/4 inch. 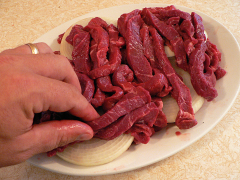 Spread the meat out in a single layer. Use a dish with a lip, not just a flat cutting board like I almost did. You’ll see why later. Season with salt and pepper. 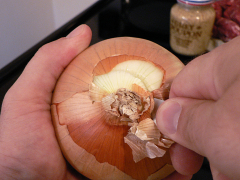 Or, if you think everything goes better with garlic, use some of that home-made garlic salt you made to take to the island on vacation but left behind. 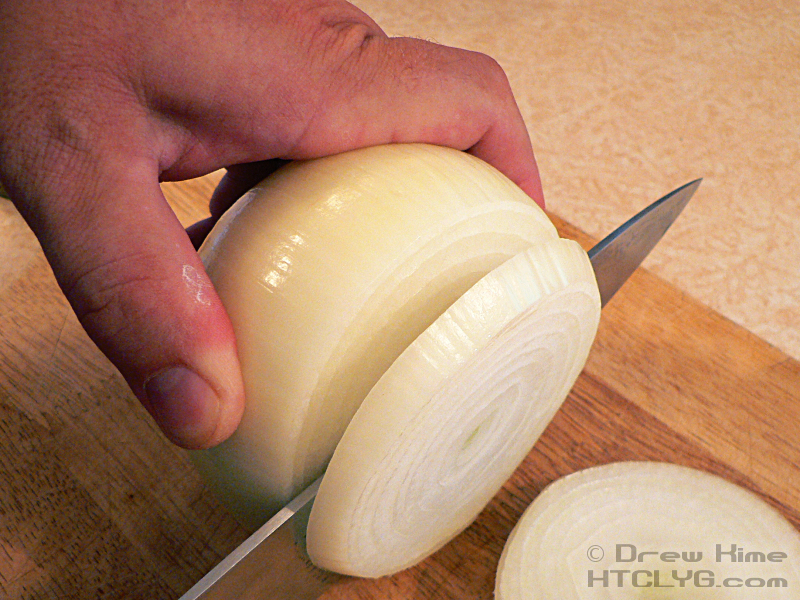 Then cover with a layer of onions. If you got a bit more beef than you planned on, like I did, or your plate is too small, do a second layer just like the first. 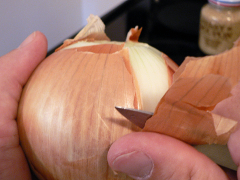 Cover loosely with plastic wrap or wax paper and set aside for at least an hour. This gives it time to marinate, and to come up to room temperature. 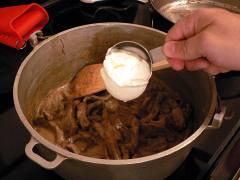 While you’re setting things out, measure out the sour cream and set it out with the beef. You’ll want that at room temperature before you add it at the end. 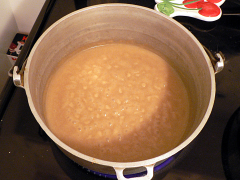 After the meat has been resting for about a half-hour, get started on the sauce. 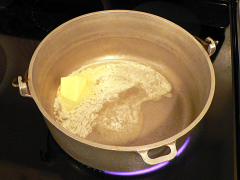 In a large pot or dutch oven, melt two tablespoons of butter over medium heat, then stir in two tablespoons of flour. Add the beef broth and stir well. 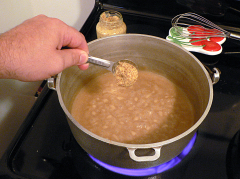 Simmer the sauce over low heat while you cook the beef. 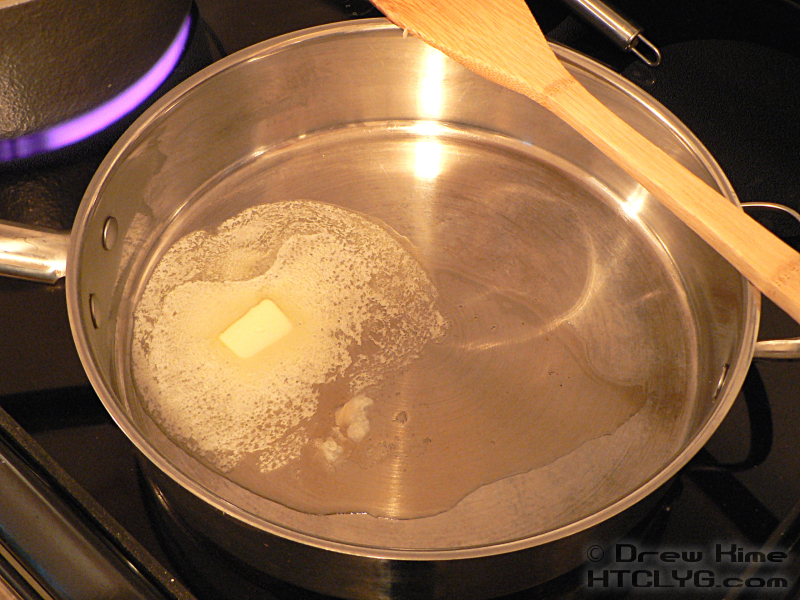 In a large frying pan, melt the remaining two tablespoons of butter over high heat. 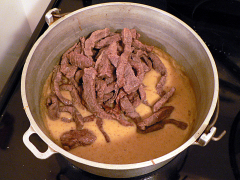 As soon as it is mostly melted, but before it starts to turn brown, add the beef. All that juice running out of the plate is why I said up above to use something with a lip. If I had used my flat cutting board that would have leaked all over the counter. 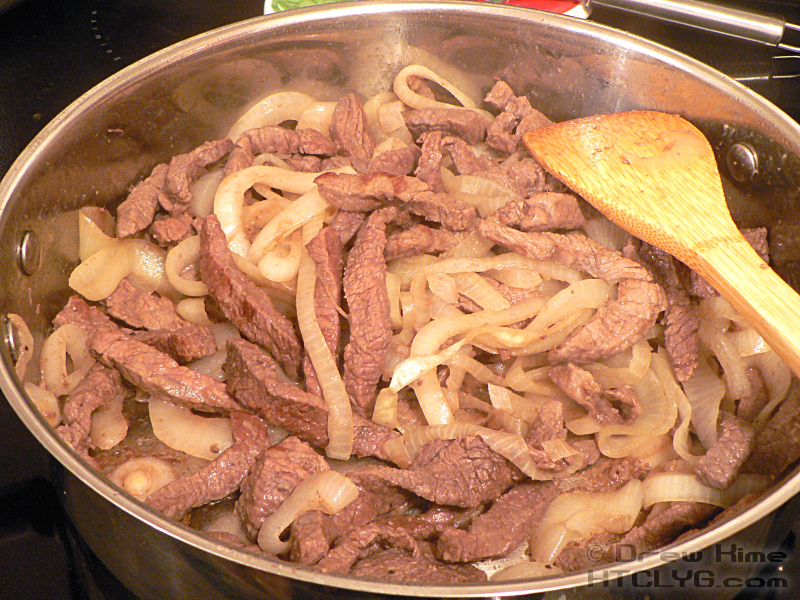 Once you get the beef in the frying pan, you’re going to be pretty busy for about 10 minutes. So don’t get distracted by things like refereeing the kids’ game of Super Mario Kart, yelling at the dog to stop barking, or taking pictures of what you’re cooking. Yup, sorry, I just got “before” and “after” shots of the beef, but no “during”. Turn the beef several times to make sure everything gets browned all over. The onion will probably give up a lot of juice. If you try to simmer it down, the beef will get chewy. 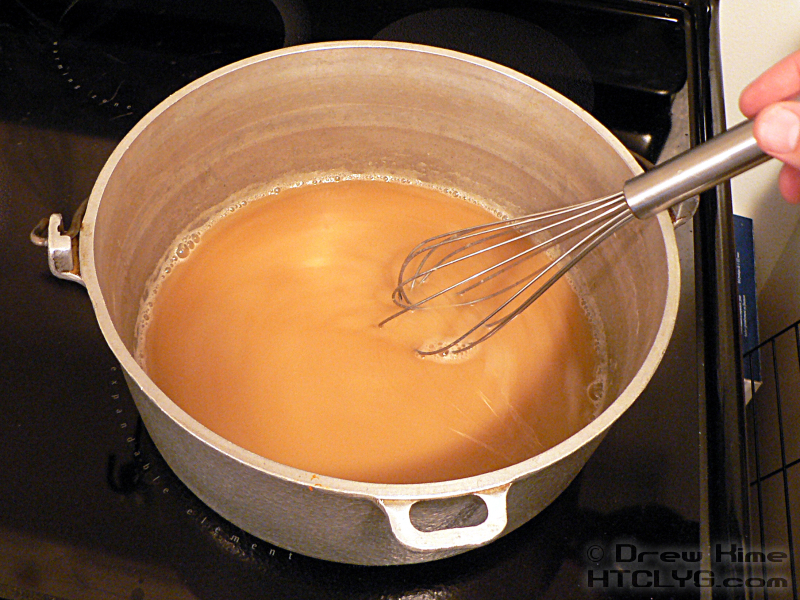 Just pour out the extra liquid. 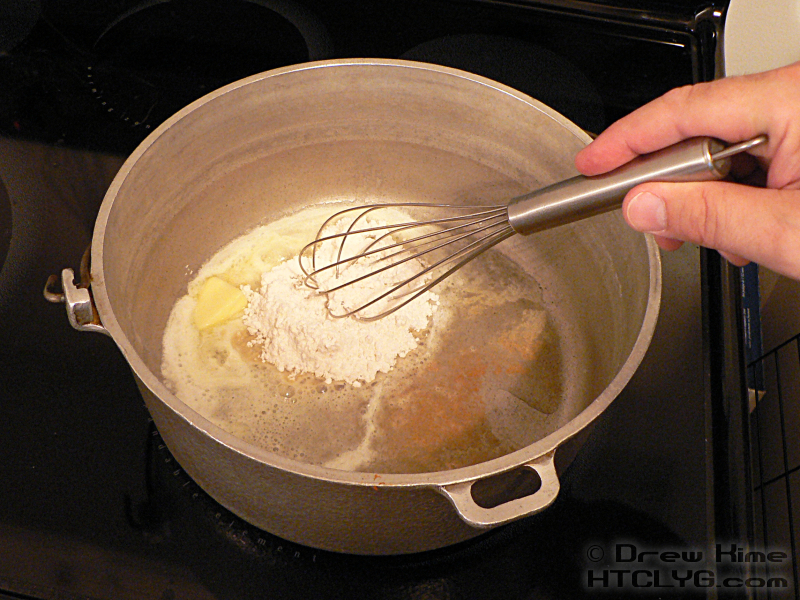 While you’re doing that, keep stirring the sauce every minute or so, so it doesn’t burn. I said you’d be busy, didn’t I? 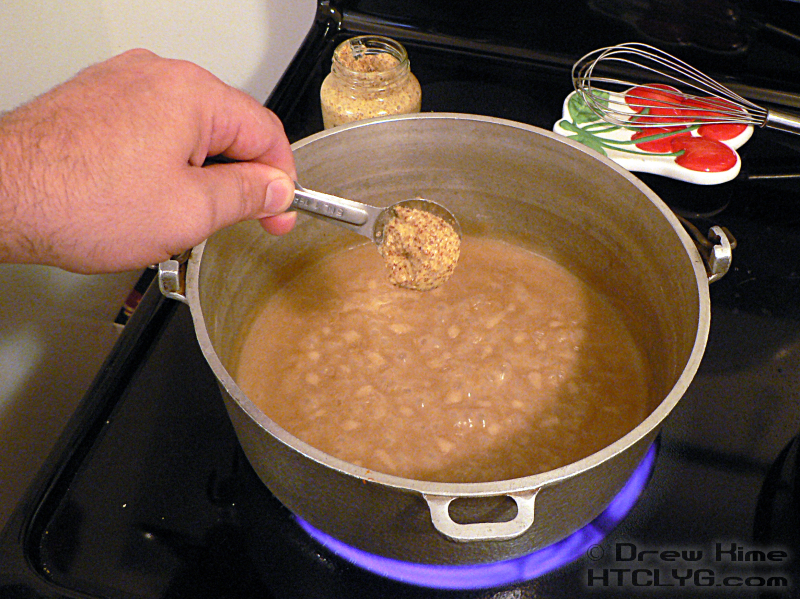 Once the sauce is thickened and starts bubbling, add the mustard, stir, and remove from heat. 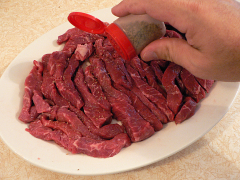 The beef should be done at about the same time as the sauce. Put the beef, but not the onions, in the sauce. 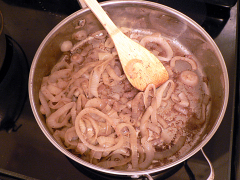 The onions you have left make a great side dish. 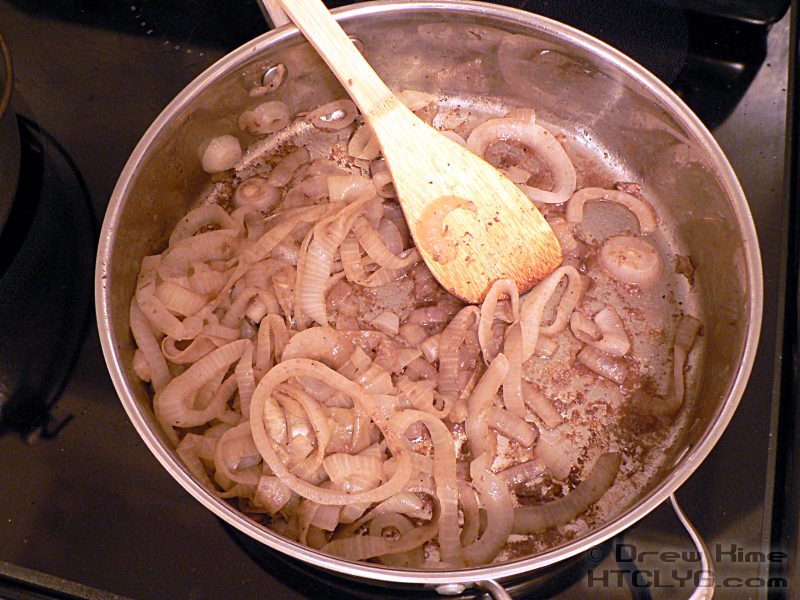 Add a bunch of salt and pepper and keep stirring over low heat to caramelize them. Simmer the beef in the sauce over low heat for 5-10 minutes. 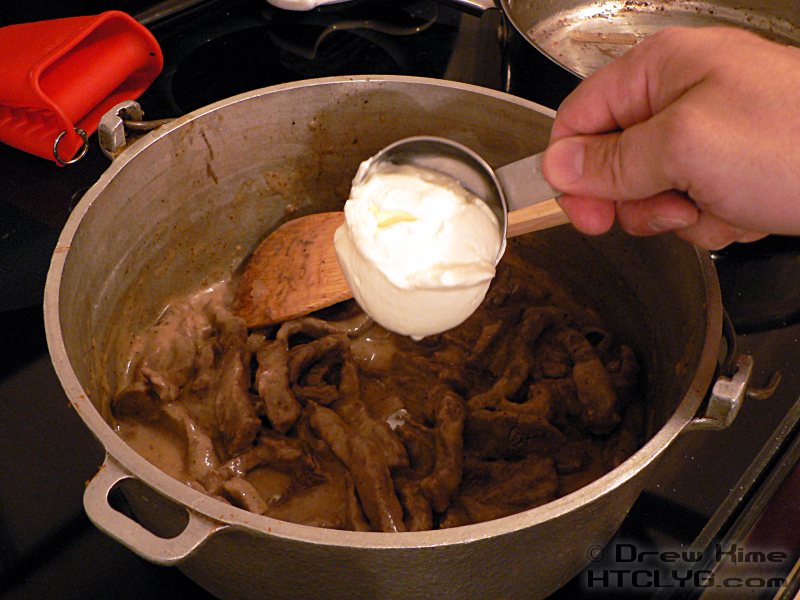 Then stir in the sour cream, at room temperature, and stir well. Spoon it out over fresh egg noodles. Because she requested it, and I made it, Kim is getting an eBook version of my cookbook. If there’s something you’d like to see, email me a suggestion. If I make it, you’ll get a copy as soon as I post it. PS: I almost forgot to share a great story about shopping for the ingredients. 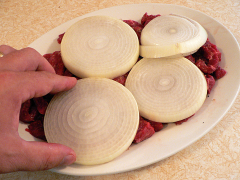 Slice the onions and beef and arrange in layers on a plate. In a large pot or dutch oven, melt two tablespoons of butter over medium heat, then stir in two tablespoons of flour. 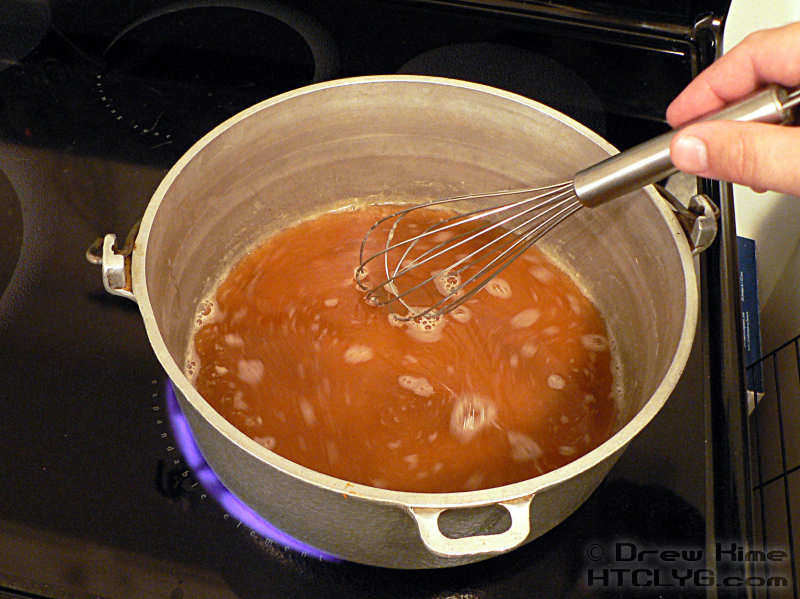 Add the beef broth and stir well. Simmer over low heat. 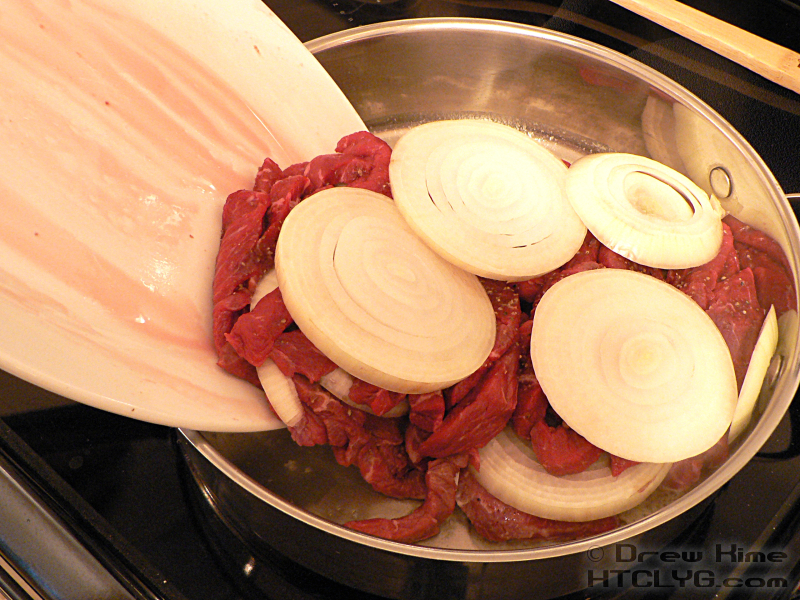 Fry the beef and onions in butter in a frying pan. Add browned beef (but not onions) and mustard to the sauce. Simmer for 5-10 minutes.